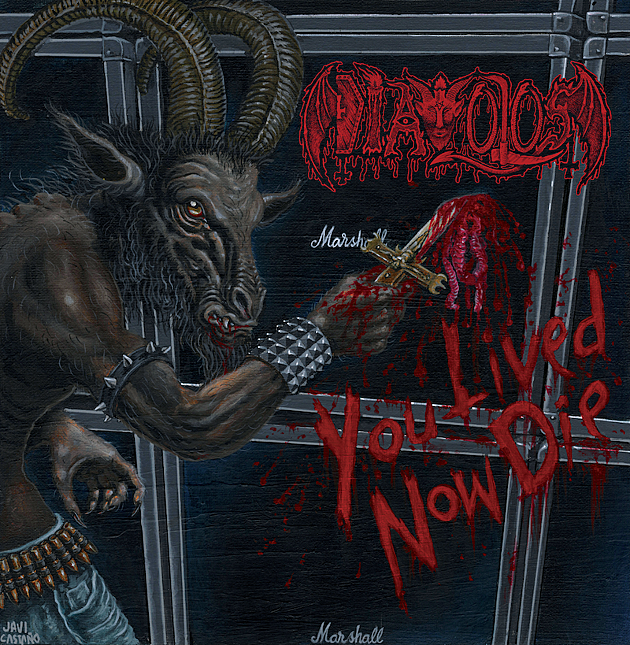 Diavolos make their home at Hell’s Headbangers Records (Midnight, Shitfucker, etc), in case you couldn’t tell by the bullet-belted goat boy on the cover of their debut LP, You Lived, Now Die making graffiti on a Marshall stack with a bloody crucifix. It almost bends over backwards to telegraph exactly what you’re about to hear, and does a pretty good job. What you’re about to hear is a snappy bit of grimy death, hence why we’re streaming the title track below. What can you say? It’s good branding, and Diavolos is a band that toe’s that label’s party line. In this case it’s an old-school death metal drinking party—like their labelmates, the band plays early-’80s fun-style death metal. If the production were a little cleaner, some people might call it death and roll. The band has an impressive pedigree as well, featuring Taneli Jarva, formerly of Impaled Nazerene, as well as Tas Danazoglou of Satan’s Wrath, two musicians who specialize in this kind of bouncing, dirty ultra-simplified slaughter soundtrack music. You Lived, Now Die is out on December 11 via Hells Headbangers.